Northumbria, now known as Northumberland, is England’s northern-most county. It’s a land where Anglian invaders fought Celtic natives, Roman legions guarded a walled frontier, and Vikings raided. Norman nobility later built castles to suppress rebellion and defend a contested border with Scotland. The border region between England and Scotland once stretched from Edinburgh to the Humber (tidal estuary). Events of the area caused the border town of Berwick-upon-Tweed to change sides 13 times. It has it’s own flag, tartan, dialect and musical instrument – the Northumbrian pipes, a version of the Scottish bagpipes. A legacy of its turbulent past, including infamous Border wars which raged from the 14th to 16th centuries, Northumberland boasts over 70 castle sites … the most of any county in England. Day 6: Bamburgh Castle- once home to the kings of ancient Northumbria, Bamburgh Castle is one of Northumberland's most iconic buildings. 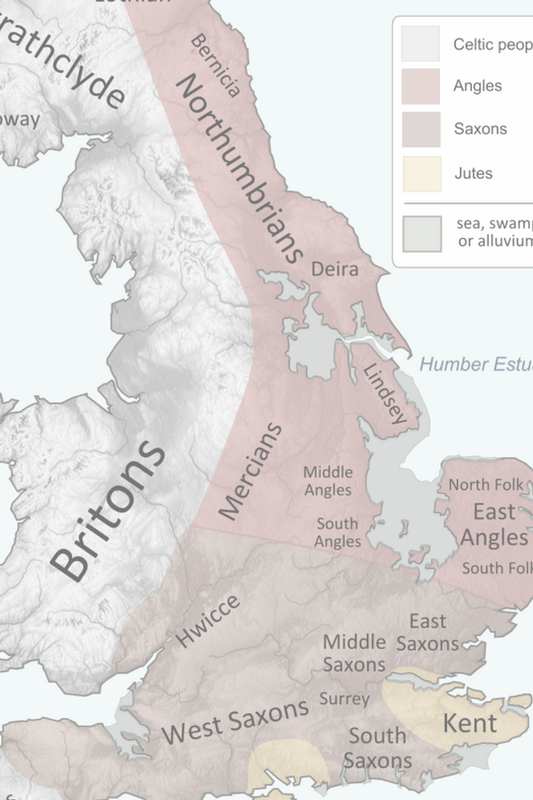 Historians state that only a handful of Saxon families in Northumbria survived the Norman conquest. The Ogles of Ogle (a small hamlet) were among them, and the family surname was first recorded after the invasion of 1066. It was written as Hoggel, Oggehill, Ogille and Oghill in its earliest forms. Walter fitz William arrived with the Conqueror and was given the barony of Whalton. By 1125 Humphrey de Hoggel (b. in or before 1085), had a charter from FitzWilliam to make his own mill and cultivate his own land in fee and inheritance. FitzWilliam also granted him, “all such lands and liberties as he or any of his predecessors had before the coming of the Normans into England.”1Ogle (1902), states that the original pedigree on the walls of Bothal church claim that Walter fitz William came with the Conqueror, but adds that the Pipe Rolls show another man with the same name who probably died around 1181, (p. 26). In 1346 David II of Scotland, son of Robert the Bruce, was defeated and captured at the Battle of Neville’s Cross. He was first detained in the peel tower then later transported to the Tower of London. The castle was once again the center of conflict in 1640 when troops from Scotland were quartered on the site. The present house is most likely the south-west portion of the old castle, the great number of fireplaces indicates that it was probably used as a hunting lodge. Eglingham Hall is a Grade 2 country house.3“Eglingham Hall.” Gatehouse. http://www.gatehouse-gazetteer.info/English%20sites/2527.html At one time, the estate consisted of thousands of acres but today it’s the hub of a working farm of about 200 acres of grazing for sheep and cattle. From 1514 to 1890, it was home to a junior branch of the Ogles that descend from Henry Ogle of Choppington. Henry was the second son of William Ogle of Choppington (b. abt. 1412 – d. 10 Aug 1474), and therefore a nephew of Sir Robert de Ogle, 1st Baron Ogle (1406-1469). Prior to 1549, Henry’s grandson Luke (d. 1597), probably inherited Eglingham from his uncle, Sir Mark Ogle of Eglingham (d. before 15 Nov 1550 s.p).4Mark is presumed to be the uncle of Luke II Ogle of Eglingham, (Ogle, 1902, p. 193). Henry Ogle of Eglingham, (1600–1669), was Deputy Lieutenant of Northumberland in 1644 and represented the county in 1653 and 1654. His son Capt. John Ogle (1621– 1686) was a commissioner for compounding in 1652 and High Sheriff of Northumberland in 1654. In 1728, the Hall was rebuilt in grander style. It included a seven bay facade possibly by architect William Wakefield. The Ogles remained in possession of the manor until Eglingham Hall was sold to the Bewick family in 1890. Kirkley Hall is a beautiful 17th Century Grade II listed building situated in the Northumberland countryside just outside of Ponteland. The hall is part of the Kirkley Hall campus of Northumberland College that has provided agricultural and land-based training for over 50 years. It is a significant stop on our tour as it was the home of the Ogles of Kirkley for over 400 years! In 1526, John Ogle (b. abt. 1495), was the first to be mentioned as an “Ogle of Kirkley.” He was a younger son of Ralph, 3rd Baron Ogle and Margaret Gascoigne, and a tenant and farm steward of Sir Ralph de Eure. The Ogles of Kirkley rented the manor house from Ralph de Eure in 1610. But in 1612 the sons of Henry Ogle of Kirkley (d.1581), Mark (d. 1635) and Cuthbert of Bothal and Kirkley (b. abt. 1569 – will 24 May 1654), purchased Kirkley manor, half the township of Kirkley and 9300 acres for £1100. In 1632, Cuthbert built a house on the site of the current hall. The beautiful Hexham Abbey contains Sir Robert Ogle’s Chantry Chapel. The chantry was built for the Celebration of Holy Communion with Special Intention for the Repose of the Soul of Sir Robert Ogle who died in November 1409. Day 4: St. Andrew's Church, Bothal- Bertram and Ogle Families were benefactors of the church. Contains:Tomb of Ralph (d.1513), 3rd Baron Ogle and his wife. He was a Tudor courtier. Article originally published in the summer 2017 issue of Ogling for Ogles. Photos were taken during the September 2017 Northumberland reunion. This entry was posted in Newsletter and tagged Northumberland. Bookmark the permalink.